I've had a couple of conversations recently with people about record stores in Auckland – the lost sort – where was Record Warehouse? When did Taste Records close? That sort of thing. I guess it's part of being some sort of ageing vinyl buff, but the thought of all those places, many of which I spend endless hours in as a kid – or older – still gives me some sort of huge nostalgia buzz. I used to spend days trekking around the second-hand stores and the junk joints, now mostly long gone, looking for the hundreds of 45s that I still have in boxes that overflow in various rooms in my house. There have been countless record shops in Auckland over the years. New Zealanders have consumed vast quantities of music. However, I've only listed stores that operated here in central-ish Auckland (Newmarket, the CBD, Symonds St, K Rd and Ponsonby etc) and only shops that no longer exist – the stores that are still open can tell their own stories. And mostly I've only mentioned the stores I personally remember (although some clearly predate me), and – yes – despite my best efforts I may have made some mistakes or omissions along the way. These shops were often filled with passionate people, both in front of and behind the counter (and more than a few snotty know-nothing kids who looked down on almost all their customers and helped kill the stores, that being the nature of the industry) but despite that, record retailing is an extraordinarily risky business, more so in recent years. More than a few of these stores, most in fact – including some big operators – went bust and disappeared from the city forever. In 2015 the number of retail stores in Auckland central that sell music only or have a specialist record or CD sections can be counted on the fingers of two hands with some to spare. It wasn't always so and the 1960s to the 1980s saw over a dozen stores at any one time in Queen Street alone. Many of the most colourful and creative people I've known over the years came out of record retail or supported their creative enterprises on the rarely good wages paid in record shops. Now, where is that copy of Waves I bought at Direction Records in 1975? The original Record Warehouse premises was in Durham Street West. For the full account, see Roger King's story here. 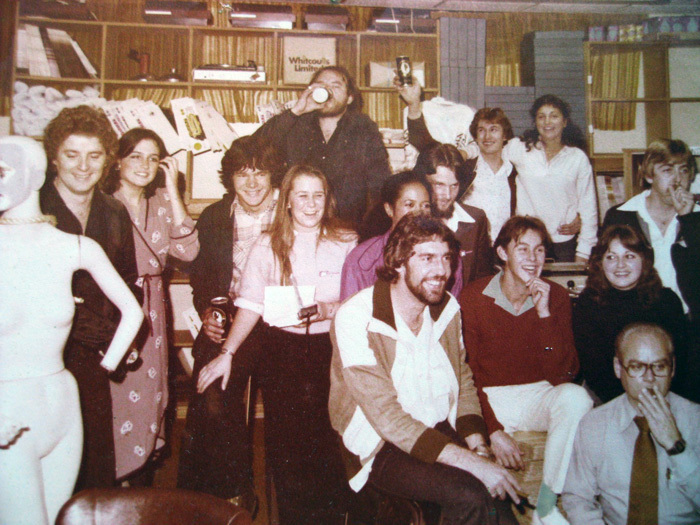 Sounds Unlimited began life in Newmarket in the early 1970s, in a small shop in Remuera Rd owned by Henry King. He opened a second – also tiny – store, with his brother Jim running it, in Pilkington Rd, Panmure, about the same time. He quickly expanded to Queen Street (first at 75 and later at 101), Papakura and into much bigger premises still in Remuera Rd. 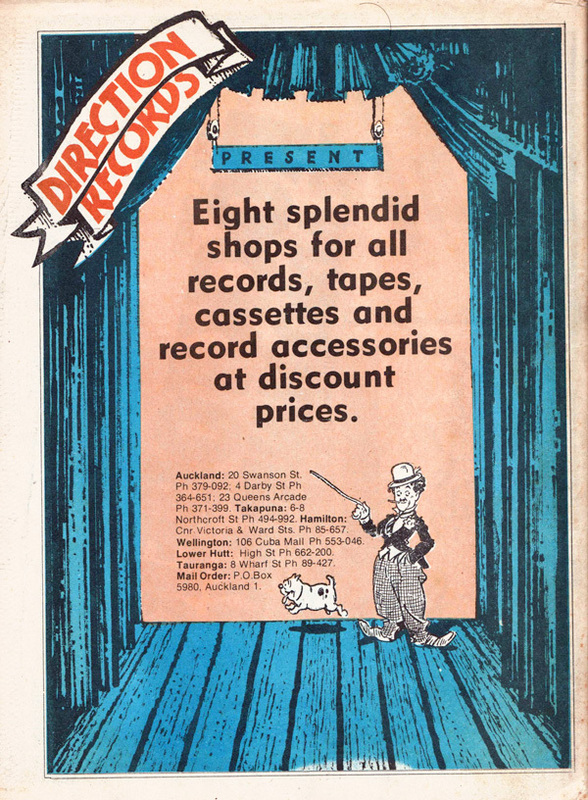 They also opened a second store in Broadway (see Broadway Records) and around 1978 moved around the corner in Panmure into a bigger store in Queens Rd. 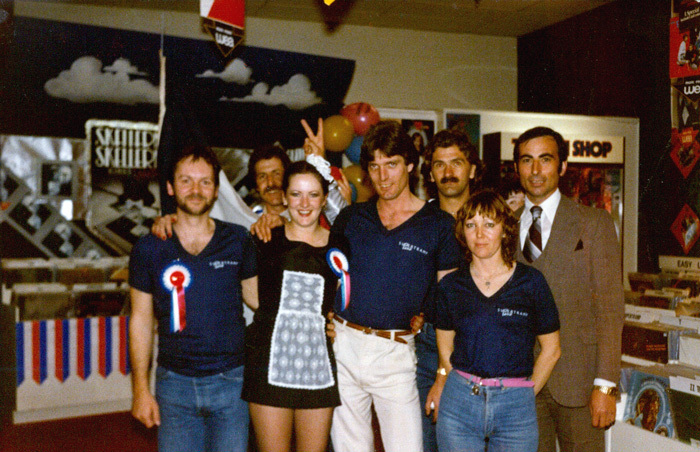 In 1981 Henry sold the chain to Gary and Allison Nuttall (the Newmarket stores), Terry Anderson (Queen Street) – the Nuttalls and Anderson were friends from Tokora – and his brother Jim Lum (Panmure). Nuttall and Anderson maintained the names and traded as a unit for a brief time but soon fell out, with Anderson keeping the Sounds Unlimited name and the Nuttalls rebranding as Truetone. Henry King moved to Sydney where he opened Chelsea Records, passing away a few years back. Sounds Unlimited eventually expanded across Auckland and into malls, but went under in the early 1990s. Sounds Unlimited had, at other times, stores on the corner of the Strand Arcade, 256 Records (see below), and a shop in K Rd, infamous for its big cocaine bust in the early 1990s. Robin Lambert, the group’s sales manager (originally from Palmerston North where he ran The Record Hunter) was perhaps the best salesman I’ve ever seen in a record store. 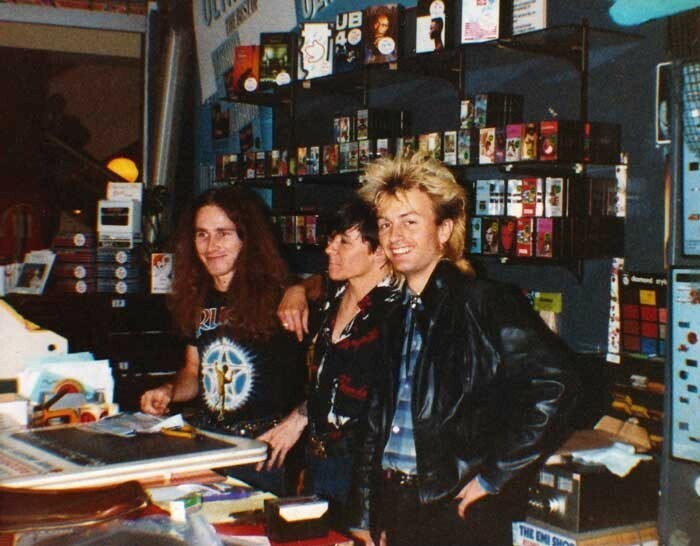 His famous refusal to sell a customer the third Iron Maiden album, because he didn’t own the first two and would not understand it, was typical (the guy left the store with all three, very happy). 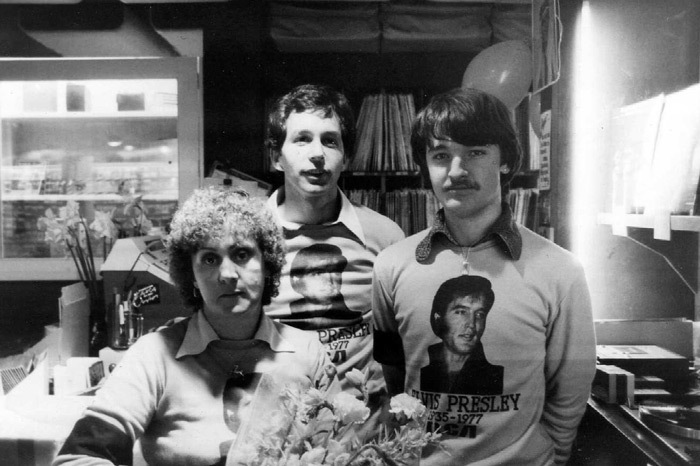 Under Henry King, Sounds Unlimited revolutionised music retail in NZ and paved the way for a new generation of aggressively fronted record stores with loss leading items and discounting. For better or worse, it paved the way for the current dominance of The Warehouse, whose music retail division, appropriately, is headed by Terry Anderson. Henry's name survives with King Exports, an independent distributor and music exporter. Sounds Unlimited's buyer, Steve Morice, also managed Push Push, which can't have hurt their chart returns. 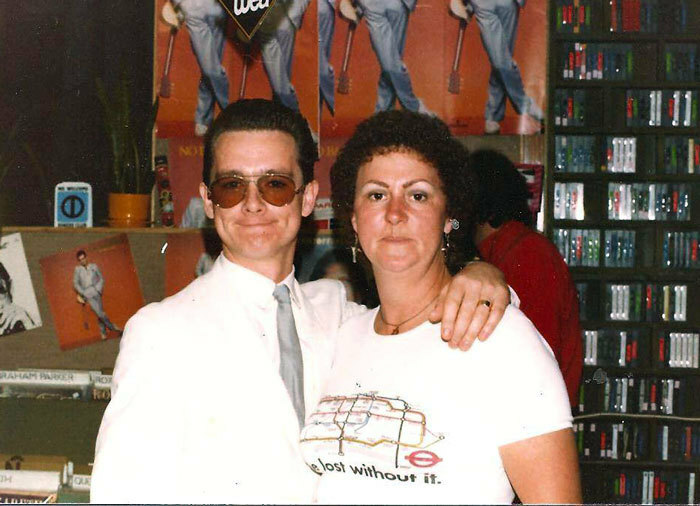 Gary Nuttall, with his wife Allison, rebranded the Sounds Unlimited stores they had purchased, as Truetone (with the exception of classical specialist Broadway Records, which kept its name) after the fallout with Terry Anderson, and expanded into the malls and suburbs. Of note was the St Lukes store, staffed by DJs Phil Bell & Jason Howson, and Andrew Gladstone, the drummer from Garageland. Under their management, it became a centre for imported dance music, both house and hip-hop. Truetone was also notable also for a heated 1988 legal battle with Festival Records over maximum pricing, which set a legal precedent which survives. The Truetone chain went under in 1999, and the stores were taken over by Sounds, who sold a few on to ECM. 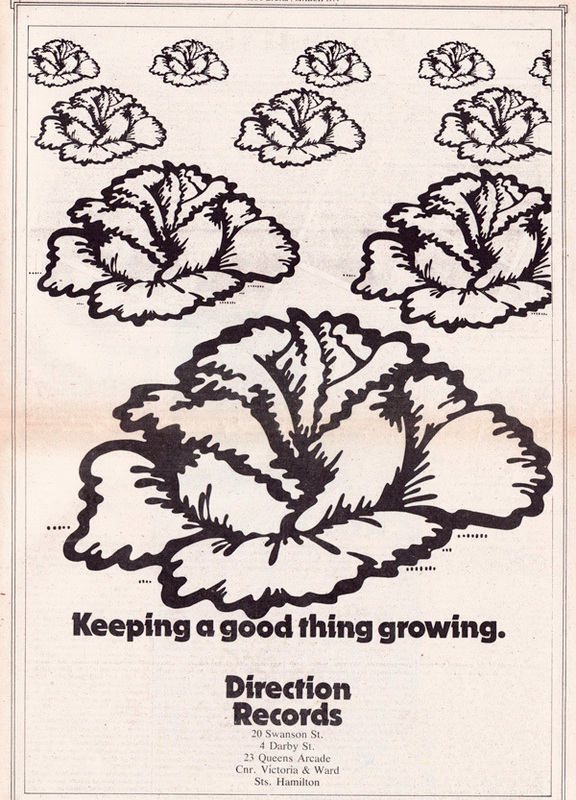 The first of the alternative stores of the post hippie era, dating from about 1971, and owned by Guy Morris and Kerry Thomas, Direction was quite an empire for a while. It had stores in Darby St, Swanson St, Queens Arcade, and outside Auckland, and sold all the hip records in recycled brown paper bags. Staff included Rhys Walker, later a key player in Taste Records. 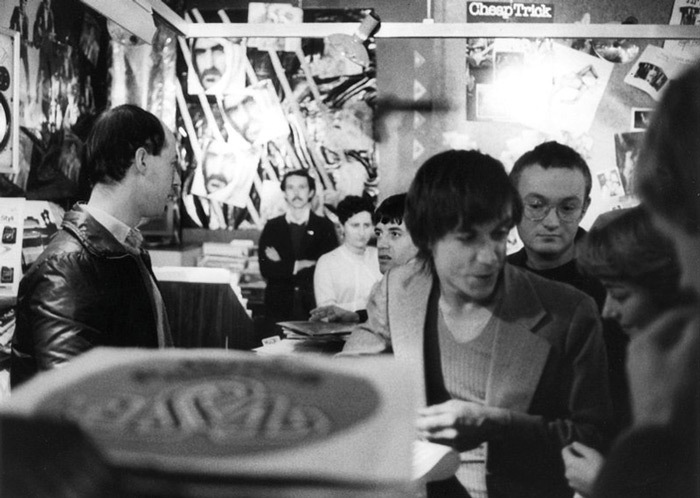 The store at 20 Swanson Street (the building is long gone in the 80s demolition frenzy) was particularly hip – dark, moody and sweet smelling (from the incense of course) and often filled with the sounds of the lastest discs being championed by the underground media. 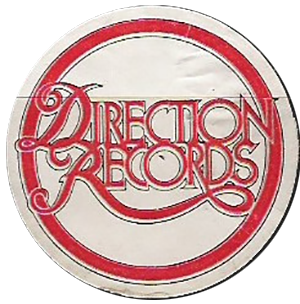 Direction also ran a record label which not only released local bands (like Waves) but licensed overseas labels including Casablanca, the first few releases from Virgin and CTI. It was Direction that gave New Zealand George Clinton, Tubular Bells and Kiss. The chain (the word seems wrong for such an underground group of stores) also included a surf mag and Hot Licks, the influential alternative music magazine edited by the late Roger Jarrett and the place to find out what was really going on - all of which was for sale at Direction of course. A champion of all things New Zealand music (and a reason why bands like Dragon, Split Enz and Space Waltz were so big), it was the blueprint and granddaddy of all New Zealand music press since. The shelves of Direction Records were often stocked with imported pressings of hard to get underground records from the USA in their thick cardboard sleeves with gatefolds. But like most New Zealand indie chains it inevitably went bust, collapsing in 1976. From it arose The Record Warehouse. The site of Direction Records store in Darby Street, once a home for the hip. Peaches was owned by then industry stalwarts Brian Pitt and John McCready, with Wellington businessman Warwick Woodward, and was essentially the retail arm of their RTC operation, which had New Zealand rights to Virgin Records and a few other labels. It operated from 1976 firstly in the Imperial Arcade in lower Queen Street and then in The Corner complex (beneath what was John Court's, then Whitcoulls, and now Farmer's, on the corner of Queen and Victoria Streets), and for many was the place to grab all those well priced Virgin reggae imports. It then opened a store in the Queens Arcade (in the old Direction store) and closed Imperial Arcade. 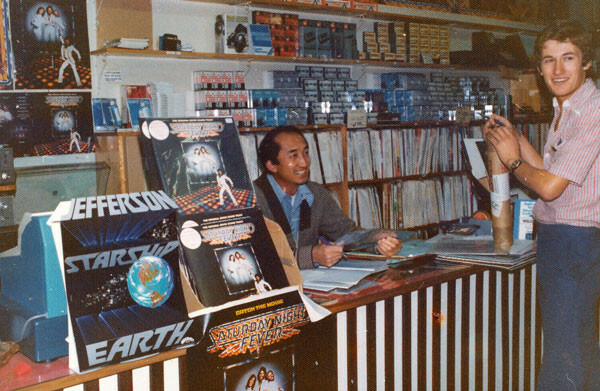 Phonogram purchased the stores in late 1977. PolyGram, the successor to Phonogram, shut Queens Arcade in 1978 (Marbecks briefly used the site as an outlet store) and sold the Corner site to Record Warehouse in 1980 and Peaches was no more. Brian Pitts reminds us that he and John McCready ran regular TV adverts for the "Peaches record of the week". Pitts produced the ads at TVNZ's studios in Shortland Street late at night where a friend allowed free time. The spots featured a model, Annie Beros, in a wet and clinging Peaches t-shirt. The weekly album was heavily discounted and sales rocketed. As a result of these ads, John McCready and Brian Pitts were working one Friday night when David Perkins from Taste stormed in, offended. Brian Pitts: "In stentorian tones and colourful language Dave addressed the shop full of customers and us, detailing our lineage and much more." The original site of Taste Records at what was then 4 and is now 2 Lorne Street. It was later Domino's Café then an Indian Restaurant. Taste was, with Direction, the other post-hippie retailer, with its doors open for business well into the punk era. 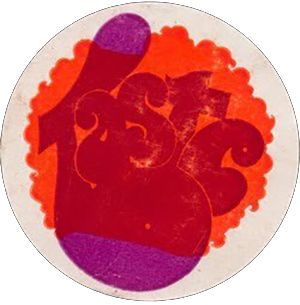 Opening in 1972, Taste was owned by David Perkins and, for a while, Rhys Walker. Rhys had worked for Pye Records and David had worked, in the 60s while at university, at a store upstairs in Vulcan Lane called The Loft. Taste opened first in Lorne Street in the shop under what is now The Lorne Street Lofts and had a special listening booth with extraction fans to allow the listener to get him or herself in the right state of mind to listen to that new Yes album. It was extraordinarily hip and in 1975 it moved into the Southern Cross building in High Street (leaving the booth behind, sadly) where along with the rock, it imported jazz and underground music. In May 1978 it took over Professor Longhair’s in Parnell (acquiring me in the process). I managed the High Street shop briefly in 1980 and ran my first label out of it, but Dave Perkins had lost interest and shut it in September that year. He was also a partner in Snake Screen printing studios, which dominated New Zealand music merchandising for years. David Perkins died in 2004. His funeral was a who’s who of the New Zealand record industry of the previous three decades. Taste Records was the first inner-city store to open on Saturday mornings (illegally) in the late 1970s, thus prompting legal action by the Department of Labour. It was a cause that the Record Warehouse would soon run with (successfully eventually). Professor Longhair’s was an offshoot of Professor Longhair’s in Lygon Street in Melbourne (a shop which later morphed into the famous Reading Books & Records) and owned by Nadine Huru, an Australian who had come to New Zealand where she had married her husband Chris (a New Zealander) in the mid-1970s. The store was in a small space just up from the Alexandra Hotel (later Iguacu) in Parnell. Chris and Nadine split around 1976 and she then ran the business on her own. 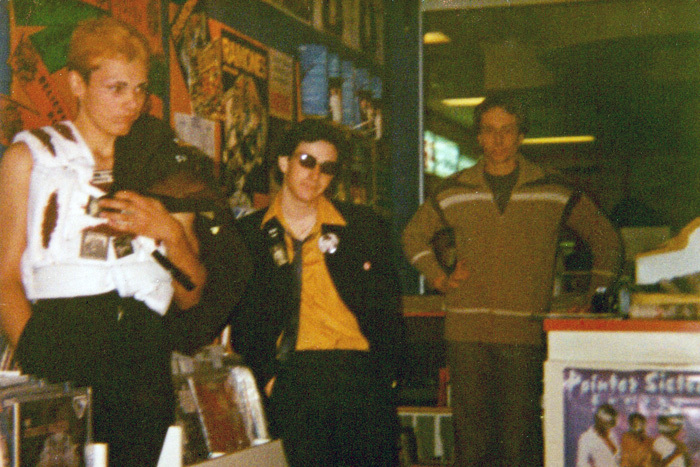 The shop was, from late 1977, the only shop which really stocked and played the punk and new wave sounds in Auckland, thus it became one of the epicentres of that scene. Not only was it the only record store open on Saturdays in Auckland City (only Browns Bay and Parnell had permitted Saturday opening until the early 1980s), but it was 150 metres up the road from the Windsor Castle, home to many Auckland punk bands on Saturday afternoons from late 1978 onwards. 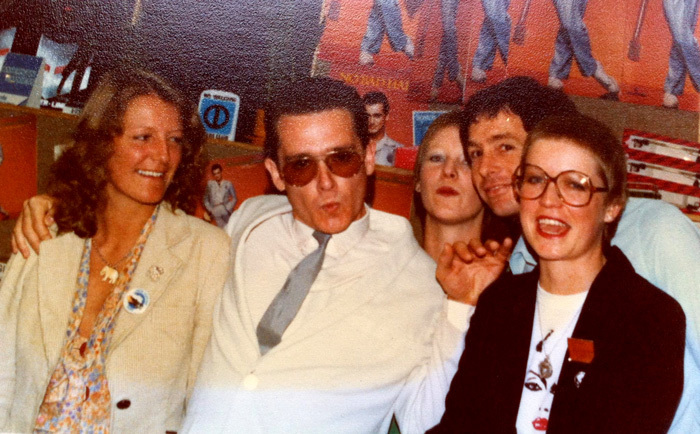 I ran it for Nadine from early 1978, with the wonderful record buff and artist Terry Hogan (the man who signed Toy Love to WEA, and did the AK79 sleeve and well as many posters and other covers) as my weekend staff. Supported by Dave Perkins at Taste, it was taken over by that store to cover mounting debts on 31 May 1978 and I went as part of the package. The site was later Parnell Records and Tapes, which operated into the 1990s. 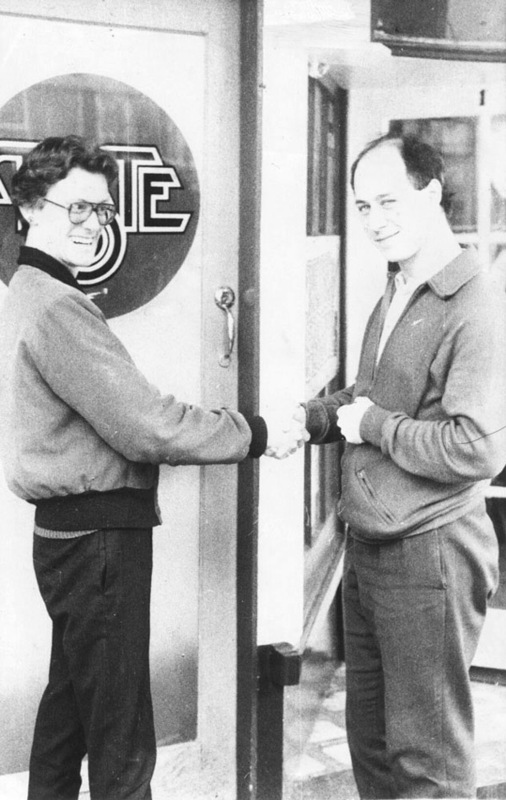 The author ceremonially handing over the keys to the Parnell Taste Records store (the former Professor Longhair's) at 279 Parnell Road, to new manager Robert Nicholson in 1979. A second-hand shop in the basement of The Corner, in the old John Court building in Queen Street, that opened in the mid-1980s, owned initially by Neville Lynch of Record Exchange. 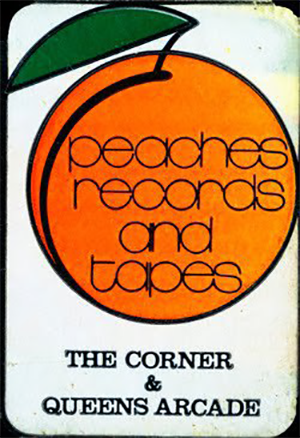 Manager David James purchased it from Lynch in 1987 and renamed it The Corner, later (around 1997) moving it to the old Record Warehouse/Rio space in Lorne Street. 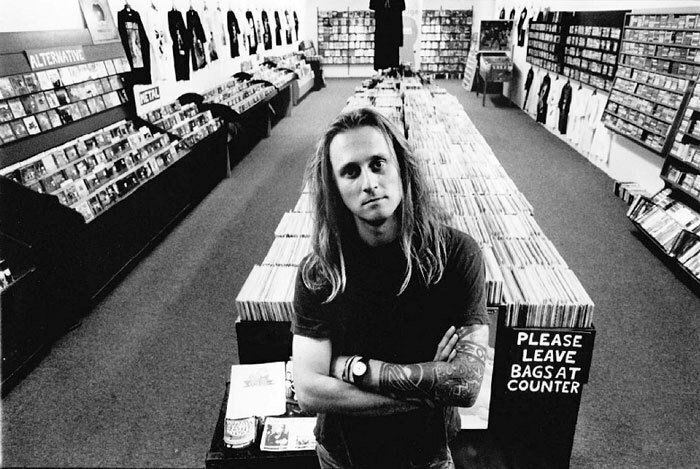 James, the bassist with Dead Flowers, closed the store in 1999, moving to Dunedin, where, at the time of writing, he and his wife Irene operate Relics, selling new and used vinyl and CDs. David James in Corner Records, Lorne Street. 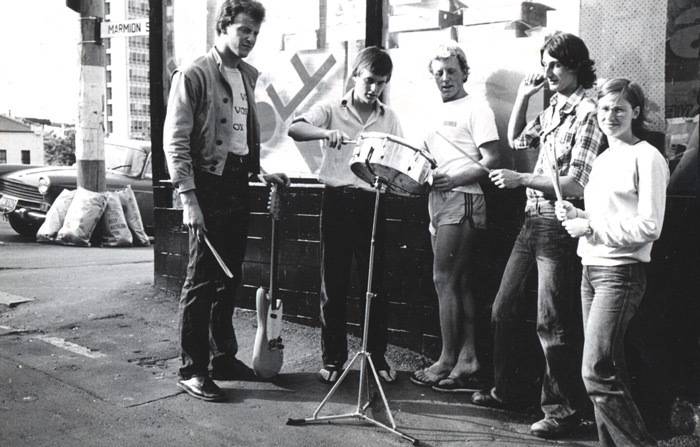 Auckland band Rhythm Method outside Rock'n'Roll Records, Queen Street, 1981. Simon Mark-Brown (second from left) was shop staff. Bill McGechie, AKA Funny Business actor and comedian Willy de Wit, is in the centre. 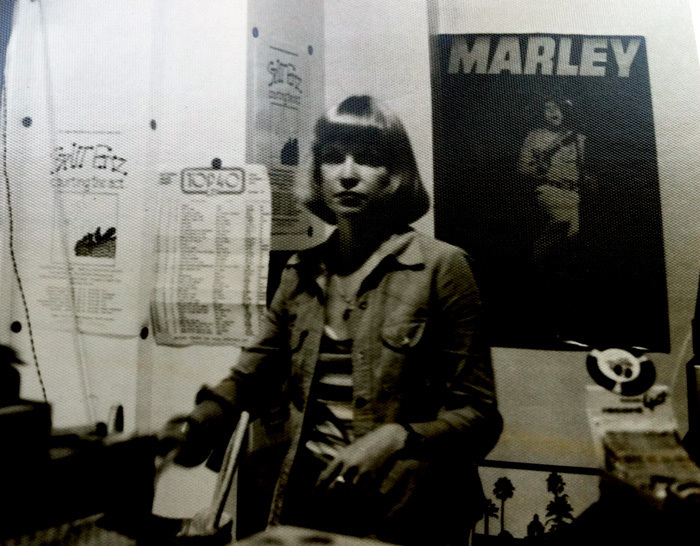 Jan Philips, the owner, opened Rock’n’Roll Records in Symonds St, on the corner of City Rd, in the early 1970s, as the first dedicated second-hand store in the city. It moved to Queen Street, just down from where Real Groovy is now, in the middle of that decade, where its staff included Simon Mark-Brown and Kerry Buchanan. It was a mecca for the vinyl obsessed and the shop’s rare records auctions were huge drawcards. I remember outbidding Graham Brazier on a Stooges album around 1979. I loved the huge boxes of 7" EPs and 45s behind the counter. It moved to Fort Street, in a space next to Fort Lane, in the 1980s, and added Kirk Gee to the staff. 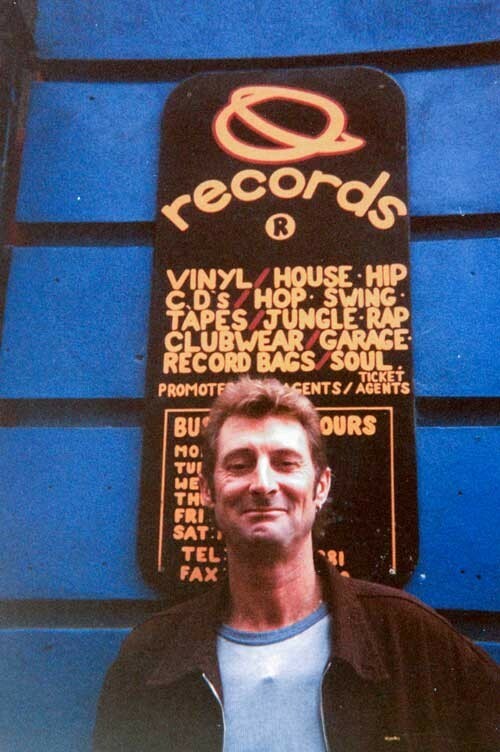 Jan sold out to Real Groovy in the late 1980s and they closed the site, moving the staff up to the Queen Street store. Phat Wax took the site briefly before it became a laundromat. 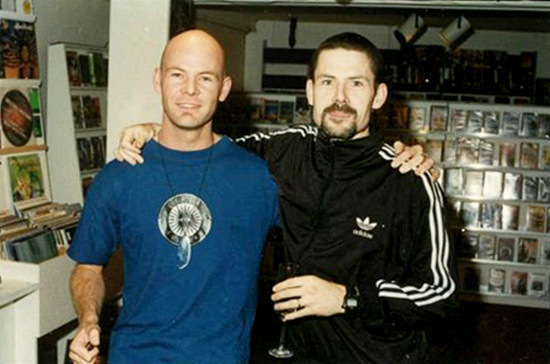 Crawspace first opened in a small space in Commerce Street, and then moved to the La Gonda Arcade, 203 Karangahape Road, from August 1992 to January 2002 and was owned by brothers Alistair (AKA Grant or Gonzo) and Stu Schmidt. The store specialised in garage, punk and indie and was also home to an important indie label, which issued 10 pressed singles and a series of lathe cut releases via Geraldine's King Records. Much of the extensive Crawspace archives of images and posters are held at National Library of New Zealand. Along with Rock’n’Roll Records, Record Exchange dominated the second-hand market for years. At one stage it took up much of the end of St Kevin's Arcade in K Rd. Neville Lynch and Chris Hart opened it in 1976 and it soon became a second-hand goldmine with thousands of copies of everything imaginable and tons of rarities. Neville bought Chris out in 1980 (he then opened what would become Real Groovy) and eventually brought in his son, Liam. 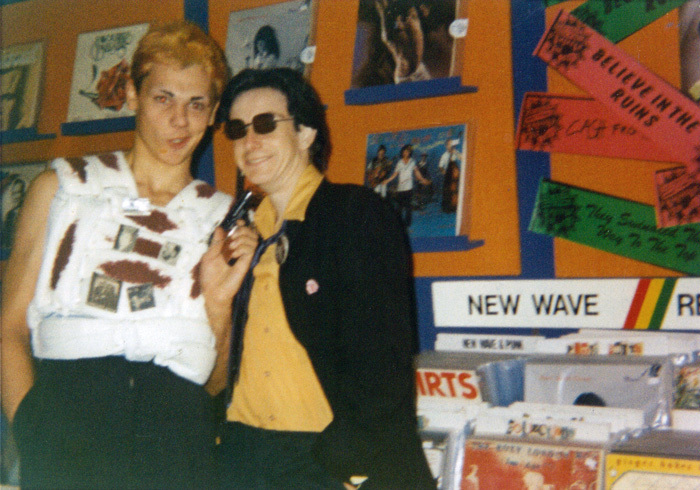 Neville moved Record Exchange in the 1990s to K Rd itself, near the Queen Street intersection. There was another shop too, briefly, further along K Rd. The retail shop has gone now but Neville and Liam continue to trade successfully via TradeMe and eBay and claim to have 200,000 records in their catalogue. I don't doubt it. Replay was a second-hand store opened around 1976 in O'Connell Street by Festival Records sales rep Rick Nelson (yes it was his real name). Rick's boss at Festival, Ray Porter, was less than happy with the idea that his sales rep was opening a second-hand store and sent in first of all a Festival person with a notebook, then the police, to check the stock for stolen records (they found none, just records legitimately owned by Nelson). 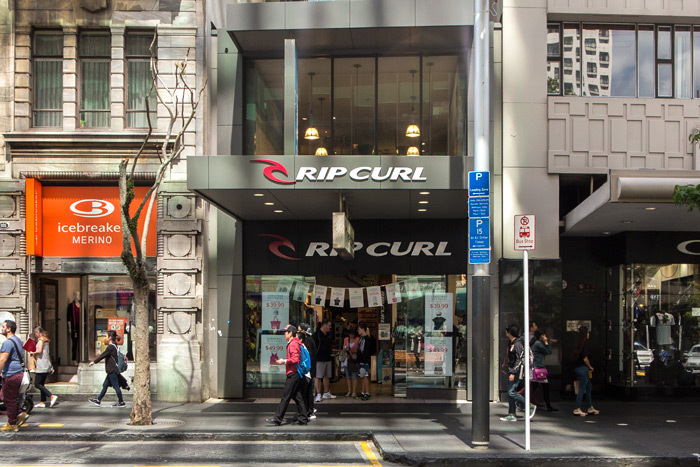 Porter was still unhappy so Rick resigned and then briefly opened a store in Vulcan Lane, although this one – also called Replay – sold new records too. By the end of the decade, Replay was gone. Grace Cardwell Scouller was a staff member at both shops, moving to Record Warehouse. This was not just a record shop but the best example of that long-forgotten artefact, a head shop. It sold music, incense, clothes, posters, and accessories of all sorts (including bongs and the like). It was around from about 1970 for a year or three in the Canterbury Arcade. It only stocked "cool" records. A popular and well-regarded dance specialist owned by DJs Nick Collings, and (initially) Adam Morris. The first store was at 1 O'Connell Street in the city, opening on 14 April 1998. It then moved to Elliott Mews in Elliott St in 1999 before finally settling at 181 Symonds St. Criminal traded for eight years, specialising in hard dance and trance. The physical store closed in November 2007, moving online. 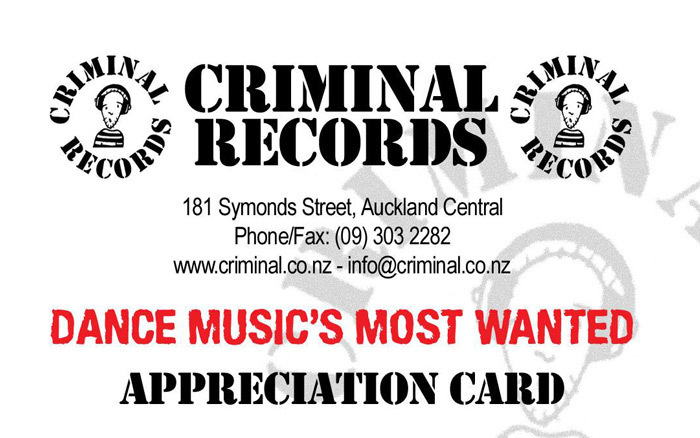 Criminal Records ceased trading in December 2008. 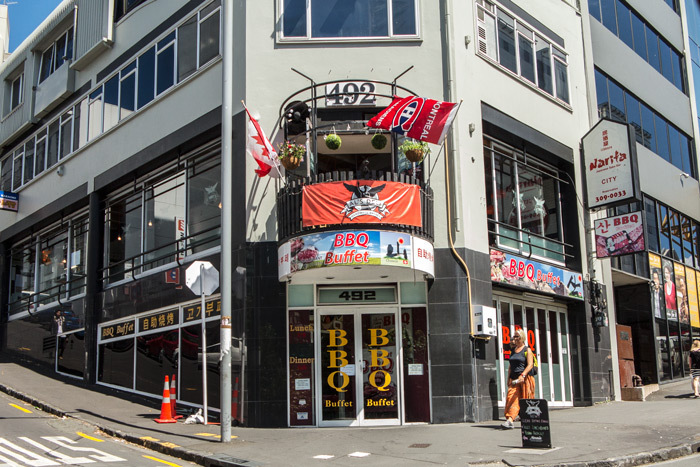 Owned by Colin Cleave, Revival began life in the late 1980s as a second-hand shop in Victoria St, close to where the Sky Tower is now, moving in the 1990s up to K Rd, before closing down later that decade. It was regarded as offering the best prices in town for second-hand records, both as a seller and a buyer. 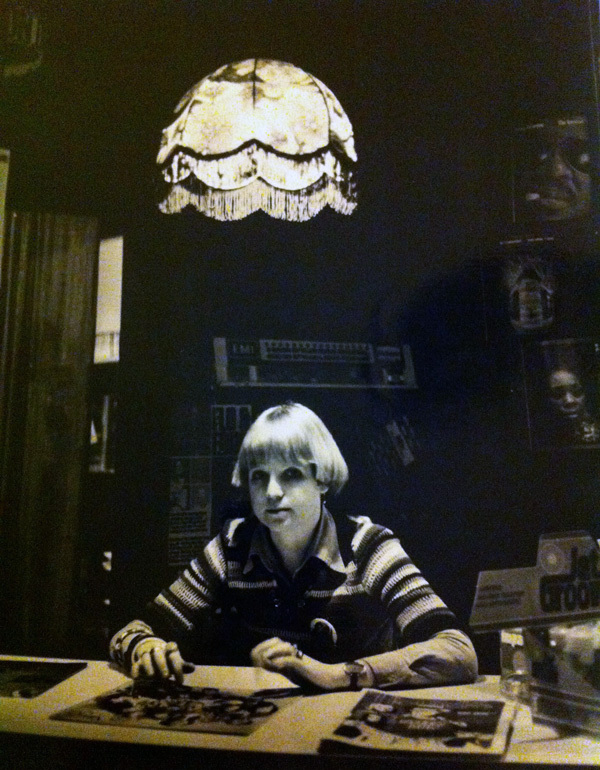 The Compact Disc Shop was opened by former Record Warehouse manager Robert Blair in the mid to late 1980s. The first store was in Three Kings. 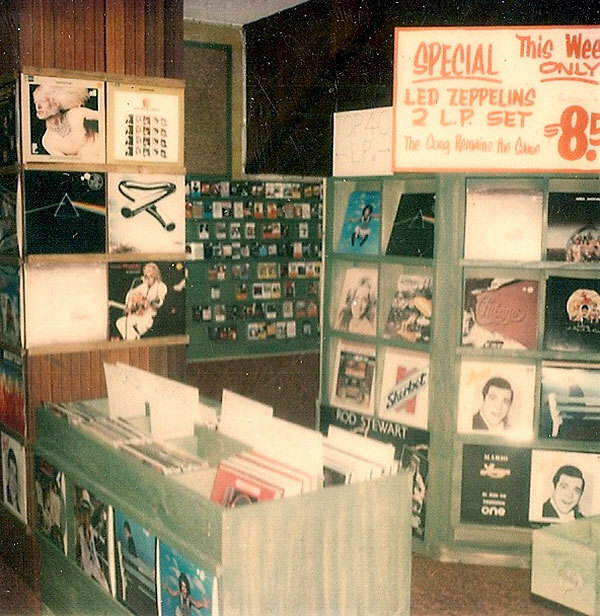 It was the first CD only store in New Zealand and within a couple of years, it had opened an inner-city branch in the Countrywide Bank Centre in Queen Street (between Wellesley and Victoria Streets). Further branches followed on the North Shore, New Lynn and in Eastridge in Kohimarama, plus another city branch in the new Atrium On Elliott. Each store had a deep stock, often at very good prices and on trestle tables inside and outside the store – another New Zealand first, but later commonplace. At some stage, the name was changed to CD Review. The stores slowly closed as the market changed and the last one – in Kohimarama – was sold in 2008. At 256 Queen Street, this store was owned at various times by the EMI groups (who first put a store in here around 1980) a couple of guys, Godfrey Woods and Kit Kingston, and also by Terry Anderson's Sounds Unlimited. From 1987 256 was the first shop to import dance music as a speciality and among its staff were Grant Kearney and Sam Hill who went on to found Bassline Records (see below). Others included Kerry George and Mike Haru. Notably, the store's first manager was Adam Holt who later went to Festival Records, PolyGram and head of Universal Records NZ. A Sounds Unlimited then Truetone owned shop in Broadway, Newmarket, that specialised in classical and jazz. I worked there part-time for about three years to support my record label work, in the early 1980s. It was managed by Mel Moratti, a record industry legend who knew everything about classical music, and is still employing that knowledge at Marbecks at the time of writing. Thanks to Mel, it was the first shop in Auckland to have a CD player and stock CDs, when the local record companies were still rather nervous about this new tech. Oh, and they also had their own magazine. On the second floor of the 246 Shopping Centre in Queen Street (where, incidentally, the mezzanine café had the best iced chocolate in the city). 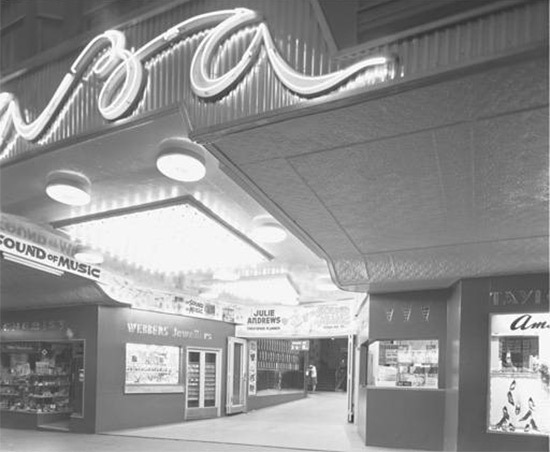 The store was opened in 1964 by the HMV company but taken over by Dennison Smith’s Record store in Rotorua when HMV/EMI opened outside the Plaza Cinema (see above) circa 1973. It was renowned in the 1970s for having the best annual sales in the city. In the mid-1970s EMI took it over again, allegedly because of an outstanding debt. Derek Fletcher, who ran it towards the end with Joanne Middlemiss, later opened a health food shop on the site of the old Direction Records in Darby Street. When Derek left around 1980, Graham Donlon managed the store. It closed in the early 1980s when EMI opened in the 256 Queen Street site. The Queen Street site of the early 1970s EMI store, to the left of the Plaza Cinema just above Victoria Street in its earlier life as a jeweller, 1964. EMI was owned, of course, by EMI Records. 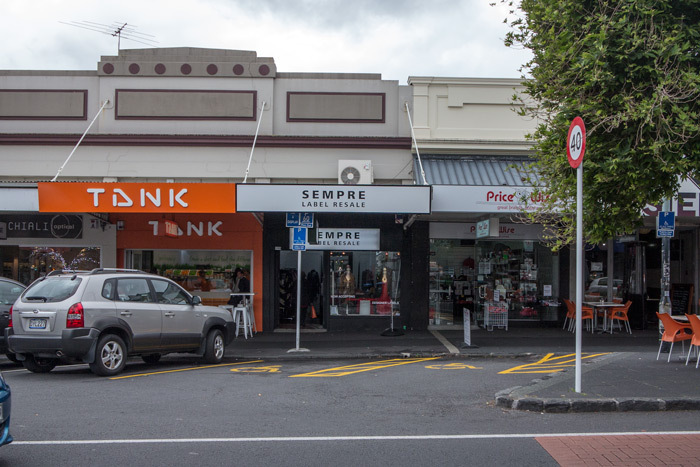 It dated back to 1913 in New Zealand as a retailer in Wellington (Gramphonium then HMV), with a store that sold all sorts of things like fridges and washing machines as well as vinyl. 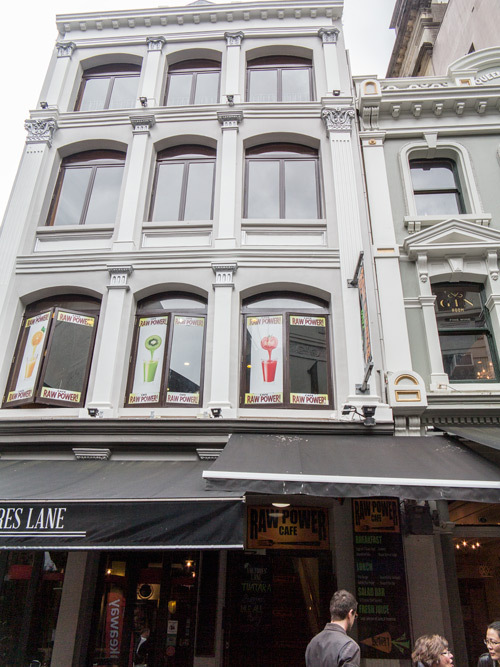 It's unclear whether the company had a retailer in Auckland at the time but it seems unlikely, although their World Record Club briefly operated in the early 1960s, firstly in Fort Street and then in the same building at 2 Lorne Street that Taste would later open in. In 1964 HMV opened a store in the 246 Building but sold it around 1973 (see 246 Records above) when they opened in Queen Street near Victoria Street (renamed The EMI Music Centre in 1973), as part of the Plaza Cinema building, although this closed around 1975. They carried a large stock, including the inevitable stereos and whiteware. It may have originally been a Columbus Radio Centre. 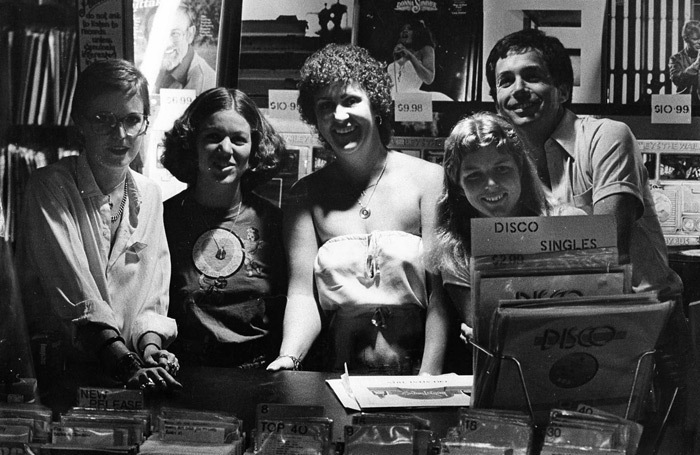 In the late 1970s EMI opened a large store in the newish Downtown Mall as The EMI Shop, and then one in the space occupied later by 256 Records. 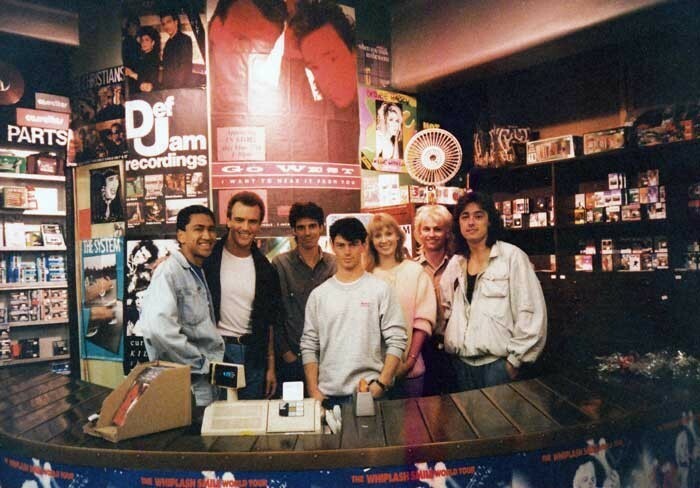 All stores held extensive stocks but the Downtown store, in particular, benefited from a very wide range of music, primarily because of the passion of the staff. The store was, for a moment, quite a gathering place and the bins were full of hard to get overseas Punk, Post-Punk and New Wave releases in those restricted days of strict import control by the government – the powerful EMI group owning the place helped with this of course. 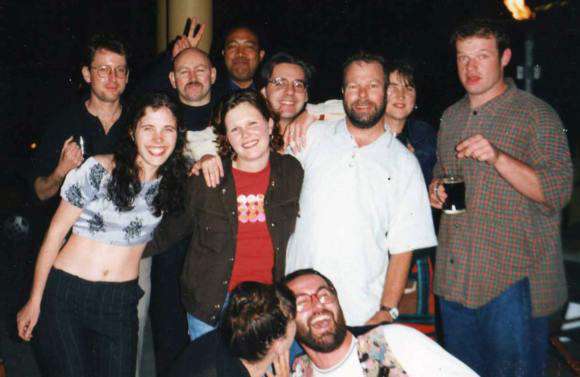 Staff included Peter Hewitt (later a manager of 256), Chris Caddick, who was later to become the MD of EMI NZ and chairman of Recorded Music New Zealand, and Adam Holt. EMI closed these in the mid-1980s and a Sounds store was in the Downtown site for a while. 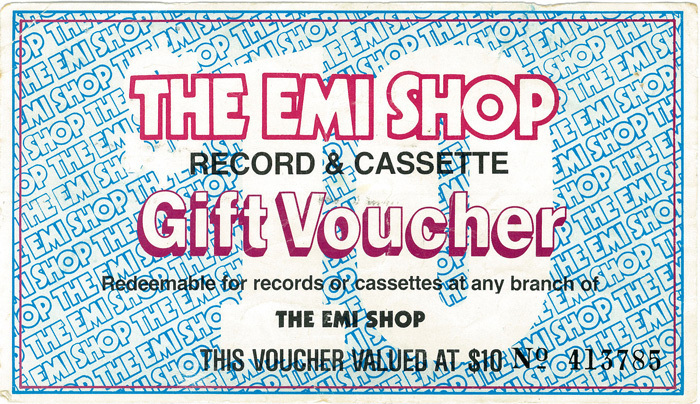 EMI briefly re-entered the retail world with HMV in 1990, although it was via their Australian retail arm (see below). 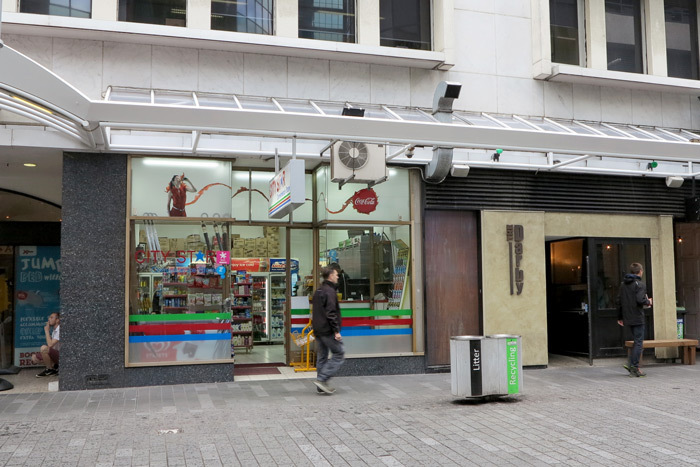 In mid-1990 the partially EMI owned HMV retail chain (a standalone division of the UK Thorn-EMI empire) re-entered the New Zealand marketplace and rented three floors, including the basement space, on the corner of Vulcan Lane and Queen Street. They opened with a huge bang, putting $10,000 on the bar at Cause Celebre for the opening party. 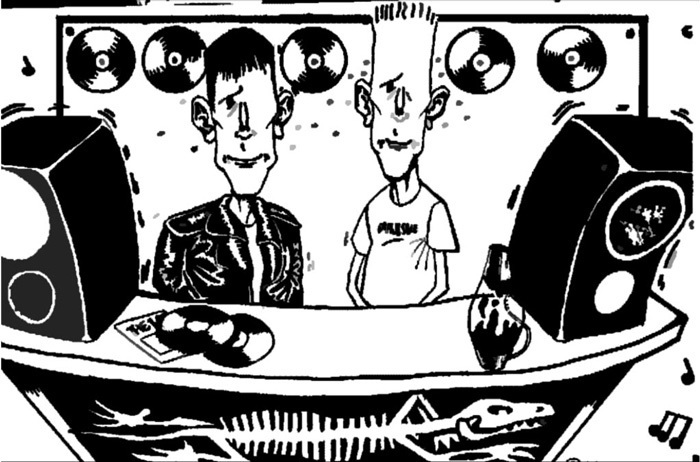 Staff included Richard Betts (later in Trutone's Broadway Records), DJ Phil Bell (later of Truetone St. Lukes and Beat Merchants) and a heavy metal counter staffed by a young Mikey Havoc. However in 1991, HMV jumped ship and their stores, including this, were sold to the Australian chain Brashs, who put the staff into odd uniforms and misjudged the New Zealand market completely. Brashs' time was similarly brief, with the Australians pulling out of New Zealand in late 1992 – they would collapse in Australia in 1996 owing record companies tens of millions. 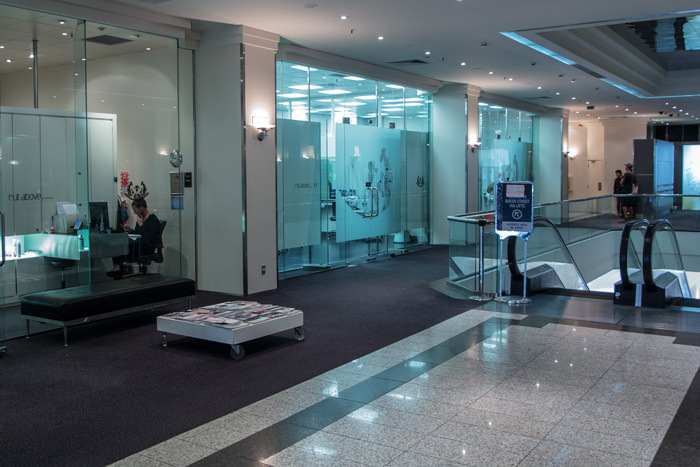 The space was then leased by the National Bank (and then the ANZ). Great bargains were to be found in their bins in their last year. Sounds was the last of the mega-chains, with its roots in the Sounds Unlimited chain and the HMV store in Queen Street, which it acquired around 1992. It had, amongst its 50 or so stores in New Zealand, a huge one in the old Whitcoulls shop on the corner of Queen and Durham Lane East, one in the old 256 store, one in the Rialto mall in Newmarket and another in the old EMI shop in Downtown. The chain was owned by Sean Coleman and managed by the late Shaun Joyce. Coleman sold it to a local franchise of the US Blockbuster monolith, but it collapsed three years later, owing the labels millions. ECM stood for Electric City Music and was primarily in the malls, but had a store in Newmarket at the bottom of Khyber Pass in Broadway. It was own by Rod Croon and operated from 1995 until the mid-2000s. There was also an ECM in mid-Queen Street, owned, it seems, by Bond & Bond around the same time. It's unclear whether these were related. The multinational book and music chain opened in the revamped Civic Building, Queen St, Auckland in 1999 (followed later by other stores in malls and around the country). It was instantly the most comprehensive bookstore Auckland had ever seen and had a huge range of imported CDs, many of which had never seen New Zealand release, and at good prices. 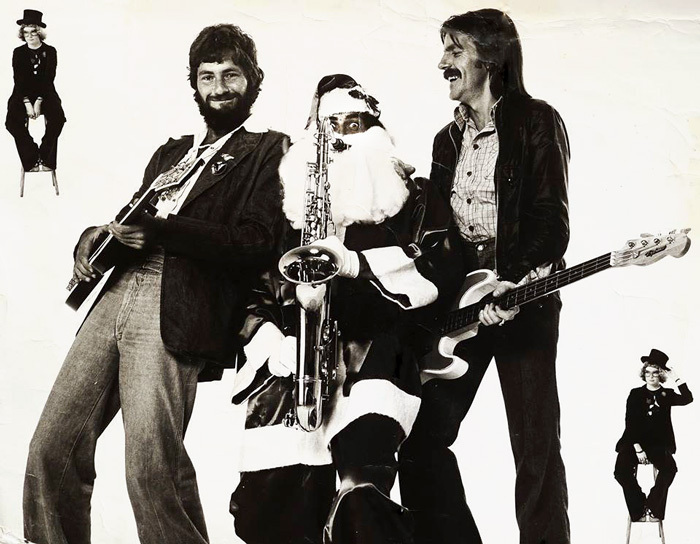 Sadly it didn't last – bad business practices (not from the staff of the music store who were uniformly excellent as I recall, headed by Michael Flynn) and falling stock meant it struggled. After a failed takeover, it closed in 2011. Cedica was a concept store – coffee and good music – and it was set up in 1999 in High Street by Phil McDonald, with Gary Sinclair (both ex-Marbecks) as manager. It was a really good idea and Whitcoulls agreed, buying the store and McDonald in 2001, moving it into their stores. What was a great idea as a hip indie store was less workable inside a colder retail chain environment and Whitcoulls made a dog's breakfast of it all, slowly stripping away the concept they had purchased. Sadly it was dead within a year, with staff moved into the DVD departments. A highly regarded indie store in Three Lamps, Ponsonby. The store was first opened by former Record Warehouse staff Richard Ludlam in 2002 as Rhythm Compact Discs. A second store specialising in vinyl opened a few doors down in 2003, managed by Kerry Buchanan, who had been hired from Real Groovy. Another store on the North Shore followed. However, they'd overextended and it soon shut, being taken over later by Peter Baker, owner of Rhythmethod distributors. Kerry Buchanan went back to Real Groovy and then to JB Hi-Fi. Around 2011 it was taken over by Joanne Catt but sadly the times were against it, and despite a strong local following, it closed in 2013. Bassline Records was later Quaff Records, then Karen Walker. Owned by Sam Hill and Grant Kearney, both ex-256 Records, Bassline was Auckland’s first dedicated dance and DJ store, and was DJ central for some years. Situated in what was later the Karen Walker shop in O’Connell Street, it was famous for Grant regularly killing the records being played so he could listen to the horse races through the PA. And the mad rush as the imports arrived. It opened in 1989 and closed about 1993 when Quaff took over the site. 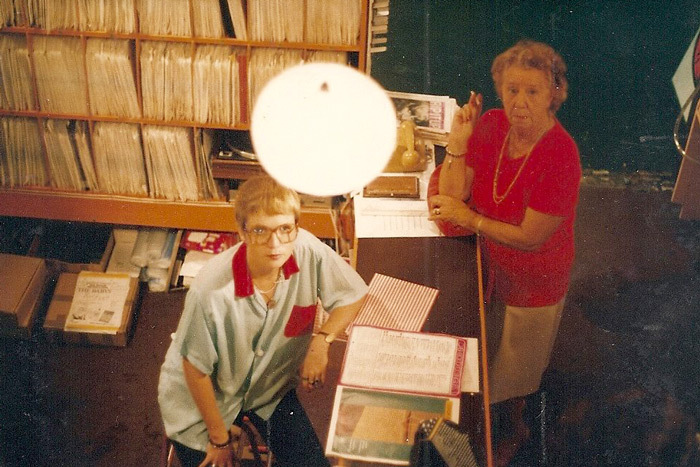 Grant Marshall provided the staff and the shop was often filled with friendly record company staff on Fridays filling out the chart returns to pad out the then less than reliable local charts. Owned by New Zealand DJ Phil 'Clarkee' Clark and UK DJ Roy the Roach, Quaff initially took over Bassline’s shop before moving down the road to a space in O’Connell Street next to Zambesi. It lasted some two years from about 1994 and sold a wide range of dance vinyl. Clarkee was also a promoter and toured several international DJs including Judge Jules who would go onto become a so-called 'superstar DJ'. In Queen Street, next to Whitcombs and Tombs (now Whitcoulls) near Durham Lane East, Lewis Eady had a huge multi-floor store with sheet music, instruments and a massive but almost impenetrable record selection, which nobody in the staff seemed to know or care about. Records were jammed into the bins so tightly it was almost impossible to browse. Although it had been there forever, and in Queen Street selling music since 1918, it closed in 1980 and moved to the suburbs. That's where it remains now, albeit long without the records. They also pressed vinyl and had their own label at one stage in the very distant past, and owned radio station 1ZR until the government decided that radio should be state-owned and forced a sale to the NZ Broadcasting Service. A store existed earlier at 15 Karangahape Road but closed in the 1960s. The old Lewis Eady store at 192 Queen Street in late 2014 – you can still see the LE logo and name. Heath Burgoyne setup Cyberculture with Mike Weston in basement premises at 151 Krd in 1993, selling alternative, industrial and electronic music. They moved increasingly into techno after 1995. 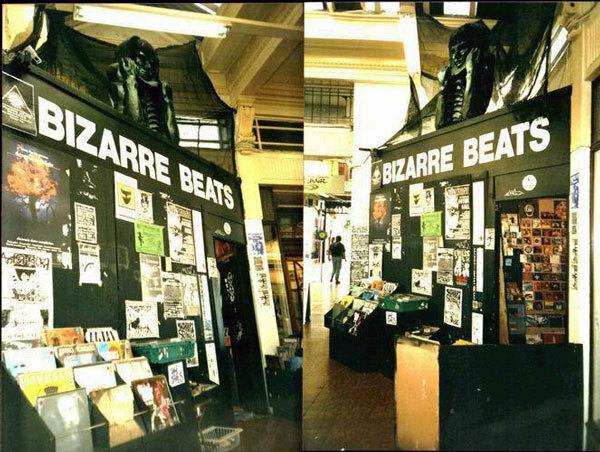 The store brought together Burgoyne's established "Bizarre Beats" 95bFM radio audience with Weston's alternative art, electronic music and event production. An on-site art gallery, recording studio, and alternative video rental library (Vertigo Video) were part of the store. 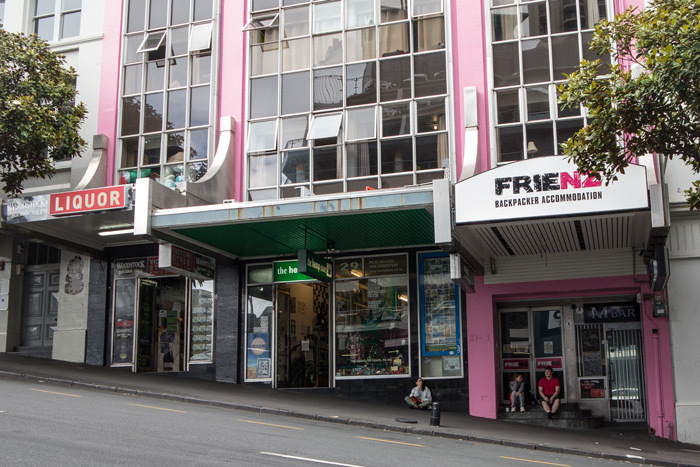 The shop was a haven for the eclectic and the leftfield and was the first New Zealand retailer to offer free Internet access. From late 1994 Weston ran his PULSE label and promotions out of the premises. In 1996 he stepped back from the record shop business to focus on that. Cyberculture was sold in 1997 to Psy-trance promoter Steve Baird of Cydonia records. 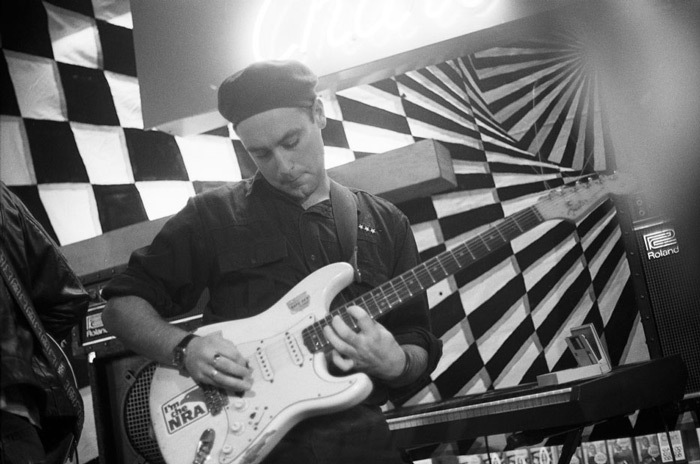 Heath Burgoyne then opened Soulsonic, initially in the La Gonda arcade and later in St Kevins Arcade. Mike Weston rebranded his business as the Area in 1998, under which name it still operates. Arthur Eady in 1938. The store would be rebuilt in 1939 and the building currently on the site was opened late that year. Arthur was Lewis Eady's uncle and this firm predated his nephew's, although by the 1960s Lewis was the dominant retailer. 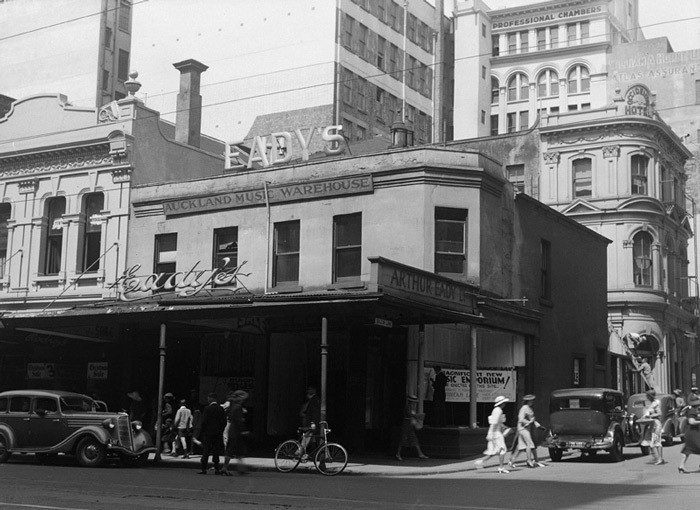 Arthur Eady operated until the late 1960s at 112 Queen Street, on the lower side of Vulcan Lane, selling instruments, sheet music and records. 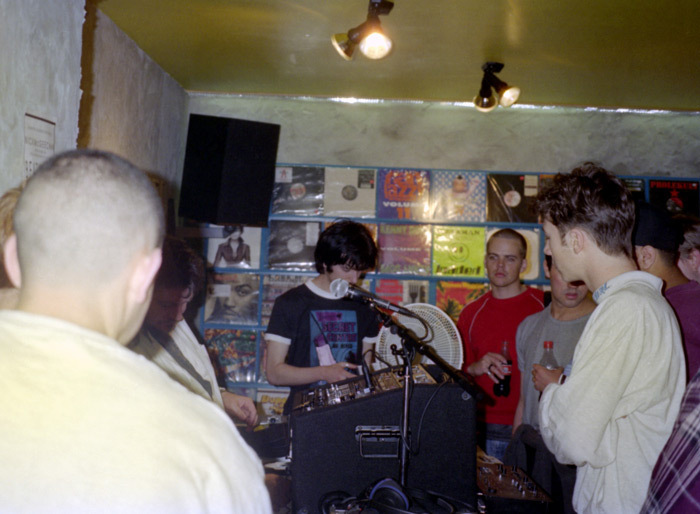 Crucial was owned by DJs Miles Kuen and Matt Drake, upstairs in the High Street end of Canterbury Arcade from the late 1990s until about 2003, selling a solid range of techno and house vinyl and CDs. From September 1996 untl May 2004, Gary Steel’s Beautiful Music offered his personal selection of the interesting, the eclectic and the plain desirable – served with coffee. The first shop was in Ponsonby (until December 1997), he then moved to K Rd near the Newton Post Office, and finally, in late 2002 to 59 Pitt Street. Amongst his clients, famously, was the late John Peel. Interesting music was often matched by an equally interesting clientele, which would often include the likes of Shayne Carter, Stinky Jim and Tom Bailey. The Lamphouse was an appliance and lighting store with a mezzanine floor that stocked records and a head office in Wellington. It was a great place to pick up long deleted obscurities that had sat in the racks for years as few seemed to visit the record department. It closed in the very early 1980s after being in the same spot for several decades, on the corner of K Rd and Queen St. I have vague memories of a Bond & Bond with a fairly healthy vinyl department in the Dilworth Building in Customs Street in the 1960s. There was for a year or two in the 1990s a record store in the mall called Little High Street, a shop packed full of imported US cut-out and new release hip-hop and R&B vinyl. It didn’t last but was a goldmine, but perhaps better suited to South Auckland. The name escapes me. A jazz store in Durham Lane East in the 1960s. Owned by novelist and playwright Gordon Dryland, the store also had a lending library of very scratchy jazz. Dryland used to sit at his typewriter in the store writing and seemed to have lost interest in the records he was stocking and renting by the time he closed down late in the decade. His novel An Absence Of Angels was named the best New Zealand novel of the year in 1966 by the New Zealand Literary Fund. Gordon moved to Australia in 1981 and the trail seems to stop there. Wiseman's was a feature of Auckland record retail from the 1920s onwards, with a store between Durham Lane East and John Courts and one in Newmarket. There were probably others. Beggs, the Dunedin chain, purchased Wiseman's in mid-1960s, renaming it Beggs Music Store, but left retail in 1970. Singer Katy Soljak recalls working in the store – her first job: "The Brew with Doug Jerebine, Bob Gillett, Harvey Mann et al would show up Friday nights, cram into a listening booth ( all of them in one) and check out the latest Hendrix, Sly Stone etc." 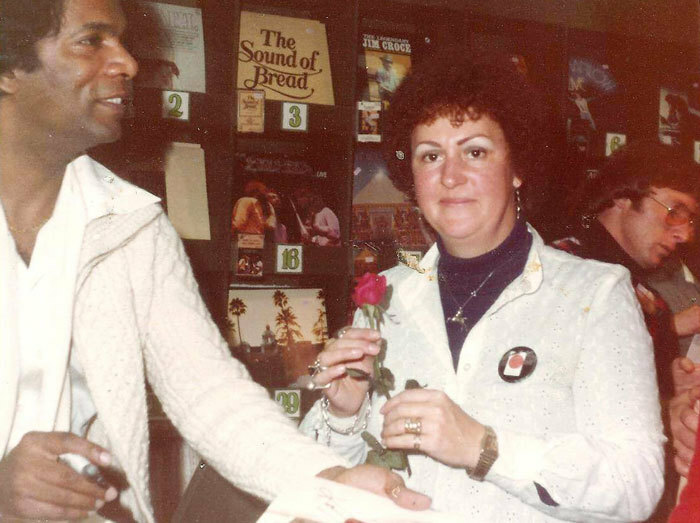 The manager in the mid-1960s was Kevin Hall and other staff included musician Rick Steele who has memories of Kiri Te Kanawa coming into the store. Another K Rd store, in the La Gonda Arcade, specialising in dance, in operation from around 2003 until at least mid-2005. It was later Lopass Records and then Uptown, specialising in dubstep and grime. An Australian dance store that opened in Durham Lane East in the late 1990s. Like Phat Wax it missed the mark because New Zealanders really (at least we thought) had a more developed musical taste than the cheese that sold so well in Australia. The next location was in Beresford Street off K Rd, where it seemed to adapt more to New Zealand tastes. It moved briefly to the top end of Vulcan Lane before closing. The Victoria Street East building that held Beat Merchants (left) and Phat Wax (down the stairs on the right). 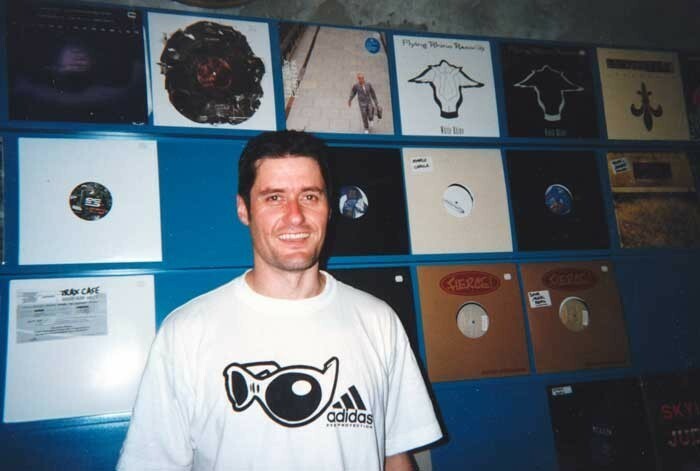 Beat Merchants was setup by ex-Truetone manager Pete Farnon with Mike Morgan (also ex-Truetone) in 1998, employing Jason Howson (from the legendary crew at Truetone St. Lukes) and situated in Victoria Street East. After the demise of Truetone in 1999, they also hired DJ Phil Bell and it was, for a time, the hip-hop, reggae and dub-step epi-centre of Auckland. Pete Farnon bought out Morgan in 2004 and then sold the business to Jason Howson in 2007. He moved the store to Grey Lynn before transferring the business online, where it still trades, albeit as New Zealand's leading graffiti art suppliers. Tony Young, an Australian DJ, opened a vinyl record store in a house in Jervois Rd around 1991, moving it to the old Rock’n’Roll Records space in Fort Street when Real Groovy bought them out. He then moved to a space in Victoria Street East just up from Lorne St. The shop had a range of Italian house to begin with, which rather confused New Zealanders, as the style had never really crossed the Tasman, but later expanded to cover other styles, although the shop never really worked. The UK Disco Mix Club first came to New Zealand in 1989 when I operated it, and sold records and mixers from my office. However, I dropped it in the early 1990s. 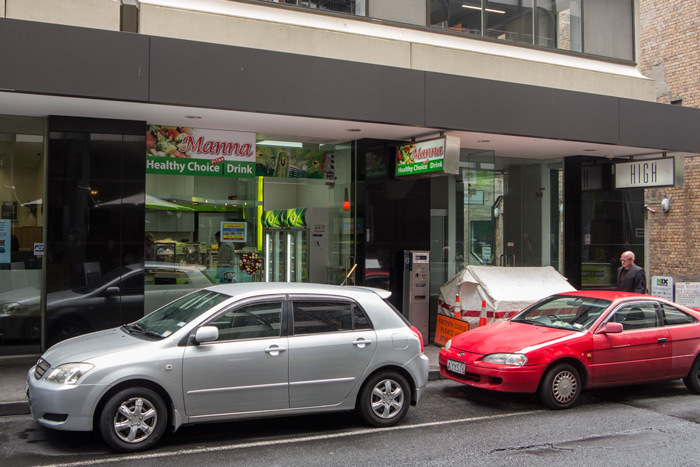 In the late 1990s a DMC store opened in the Southern Cross Building near Victoria Street selling gear, and vinyl, sourced initially by DJ Andy Vann, and then Mike Haru. It still operates, but now as Mix Foundation, in Little High Street. Another store on K Rd, which started in St Kevin's Arcade around 1994, founded by Mark Wallbank and Mike Rea, then moved down to O'Connell Street in the mid 1990s to share with Quaff, before heading back up to K Rd where, after a spell operating out of Neville Lynch's Record Exchange, it finally shared a space with Virus Clothing. They stocked Gothic/Industrial/Dark-End and experimental music. 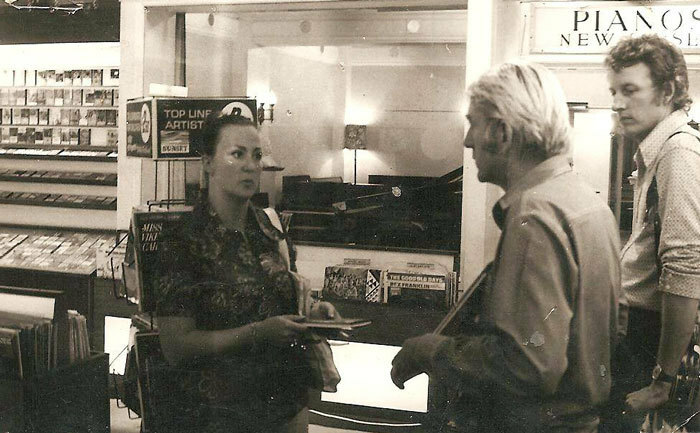 Mainstream Music was a store in K Road owned by Graham Pethig and Joanne Middlemiss. Pethig was the sales manager of Festival Records and Middlemiss, after a career in retail (see 246 Records) had been at PolyGram in a similar role. 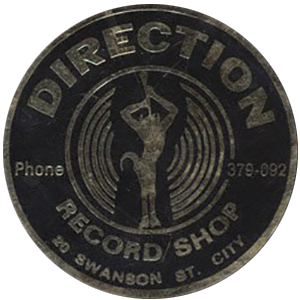 Opening in the early part of the decade, it was the only standalone record store in K Rd at the time, in a street full of department store record bars. Near La Gonda Arcade, it closed late in the 1980s when Pethig moved into wholesale with Metro Music. The site of The Loft (on the top floor). In a later life, it would be Last Laugh Recording Studios. Up a staircase on the north side of the lane, a small independent store, it operated from 1956 through to about 1972 and was owned initially by famed local jazz pianist Jim Foley. It was, for many years, THE place to buy the best jazz or cutting-edge rock and roll, all served by very passionate and knowledgeable staff. Foley's 1ZB radio show Youth Must Have It's Swing can't have hurt sales either. Later managed by Shirley Waugh, the people behind the counter included a young David Perkins, who worked there while at university, learning the skills he employed when later opened Taste Records. Jim Foley, jazz pianist, broadcaster, and owner of the Loft record store on Vulcan Lane, Auckland. 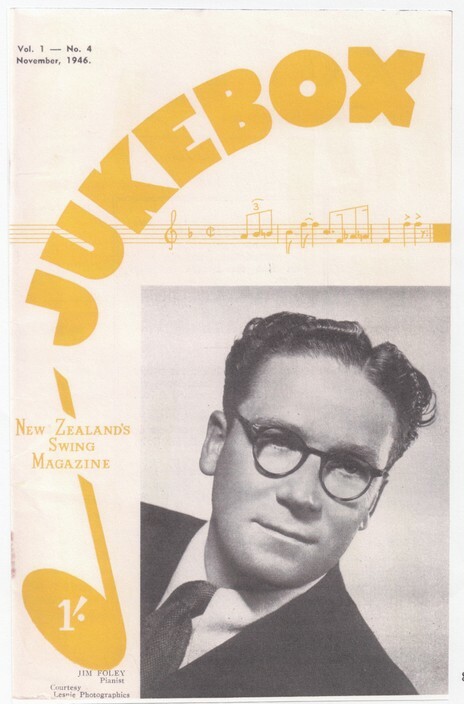 From Jukebox - New Zealand's swing magazine, November 1946. 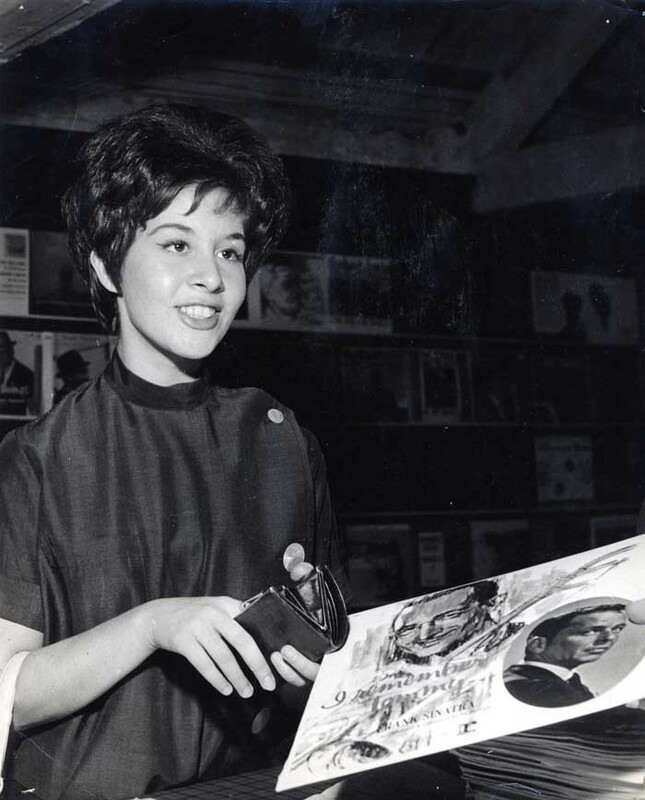 Music City existed from the early to the late 1970s and was owned by Pye (later RCA – it was tied into the RCA Record Club) and managed by the colourful industry stalwart Lorayne Tennet (she would later run Peaches). It was downstairs in part of the space later occupied by the CD Store, next to the city branch of the Pancake Parlour. Their annual record sales were legendary and caused quite the frenzy. Downstairs in the same space once occupied by both Music City and the Pancake Parlour, it operated in the 2000s and had perhaps the most adventurous stock of any chain. The shop was part of a chain that first began trading as a single store called Renegade Music at 273 Dominion Road, owned by Neil Stott. He sold that to David Reid and then opened The CD Stores. 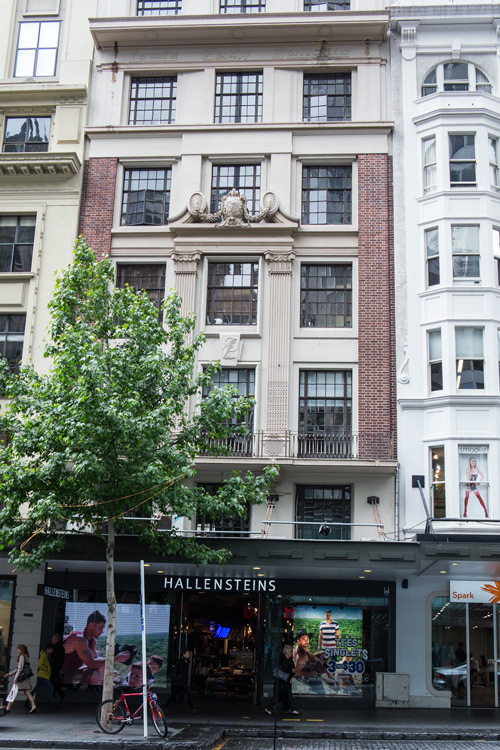 By the time it opened in Vulcan Lane it was fully owned by Roger Harper, who would later, after this store had closed, purchase Marbecks and re-brand the chain under that name, before – in a complicated series of business exchanges – eventually passing the name back to Roger Marbeck. The same space was also briefly a Record Warehouse in the early 1980s. Set up by myself, and originally with Sam Hill (ex-Bassline) and Tom Sampson to sell imported dance vinyl and CDs in 1996. 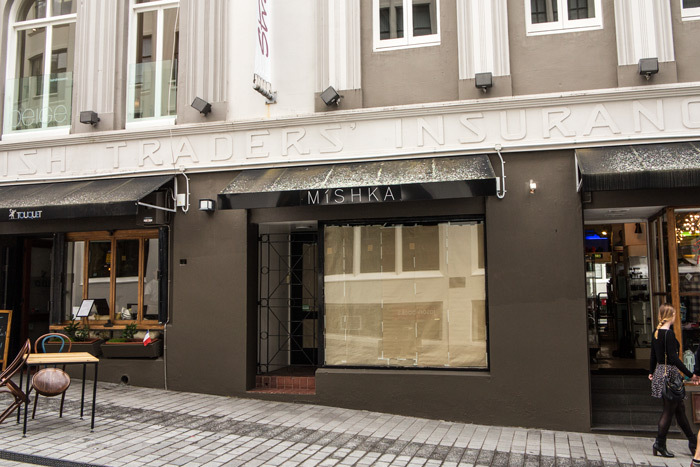 First operating out of my office, it soon moved to 18 High Street, on the corner of Vulcan Lane, where, I ran it with new partner Greg Churchill and staff, which included many of the *name* DJs in the city. 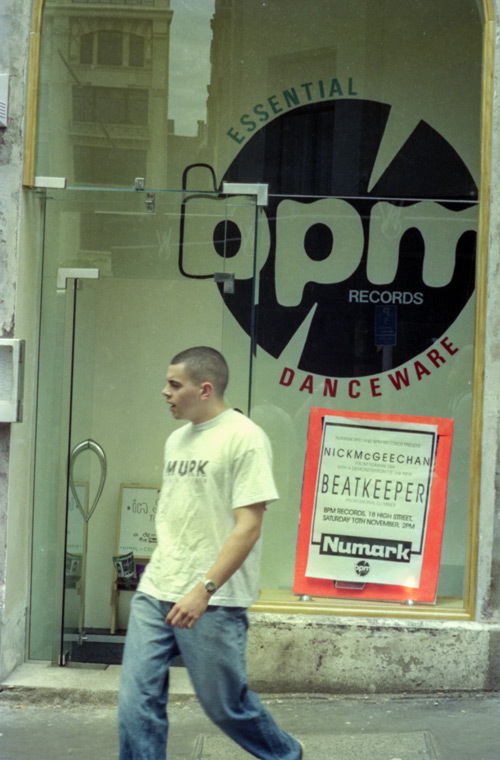 Between 1996 and 2002 BPM was one of the focal points of the thriving new club scene, often selling more copies of a club release than the rest of the country combined. It was aligned with the similarly named 95bFM radio show Beats Per Minutes, hosted by myself with Rob Salmon and then Greg Churchill on Thursday nights. A play on the show could result in 20 or more sales or orders for a new release the next day. A dispute with the landlord over a refusal to fix a broken sewer pump saw a move to 2 High Street in early 2002. The downturn in retail, the council deciding to shut off access to High Street for six months (for upgrades) and the rise of the Internet meant it closed in August 2002. Part of a furniture store near the corner of Karangahape Road, it was managed by Lorayne Tennet, later of George Courts, Music City and Peaches. The record bar closed in the 1970s and the store, by then renamed as Smith and Brown and Maple, closed shortly after. George Courts in K Rd, had, for years, a record bar just inside the door, with a smallish selection, but great sale bins. Closed well before the store closed in 1989 (after it had been taken over by Dunedin retailer The D.I.C.). Taken in 1961, the John Court building on the corner of Queen and Victoria has probably had more record stores in it over the years than any other, including John Court, Peaches, Cedica, Basement Records and the Record Warehouse. Two or three other short-lived second-hand stores were also in the basement in the late 1980s. - Photo by Vera Jane Ellis. Sir George Grey Special Collections, Auckland Libraries, 958-112. 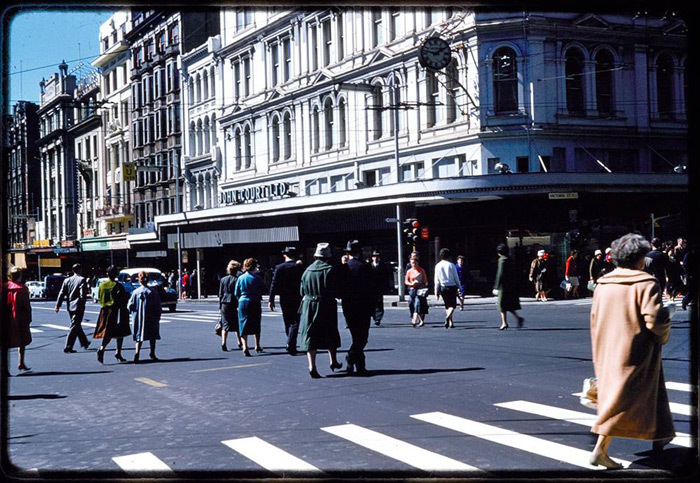 Where Whitcoulls is now on the corner of Queen and Victoria Streets, John Court (George Court's brother and originally his business partner) once had their department store (for almost 100 years) with a smallish record department. It closed in 1973 after it was purchased by a Wellington investment operation for the site. The ubiquitous Lorayne Tennet managed the record bar at one stage. Another department store that had a record department, just inside the door and to the right as I recall. They shut the record department in the 1980s. The sale bins were always worth a trawl. 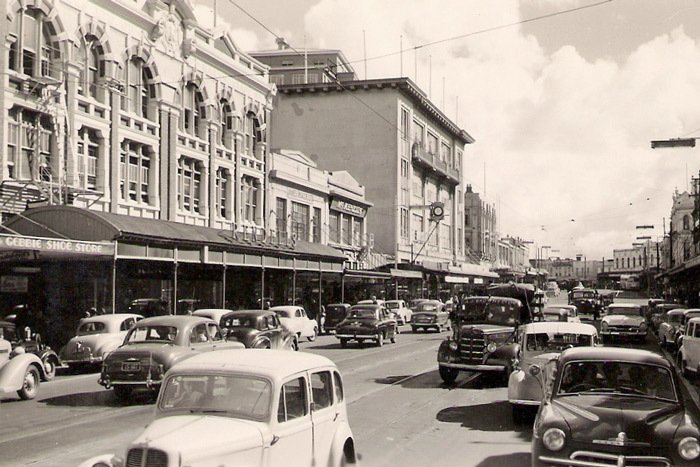 Karangahape Road in the late 1950s shows three department stores in a row, all with thriving record shops: Rendells, McKenzies and George Courts. The record department in the Hobson Street store was at one stage quite large but mostly had full bins of Zodiac and Viking label Peter Posa and Lou & Simon albums – or Pacific albums with half naked girls on the cover. I guess that was their market. The ability of Farmers Card holders to buy records on account was a major boon to their sales. The record bar was long gone from the Hobson Street store by the time it closed in 1991. 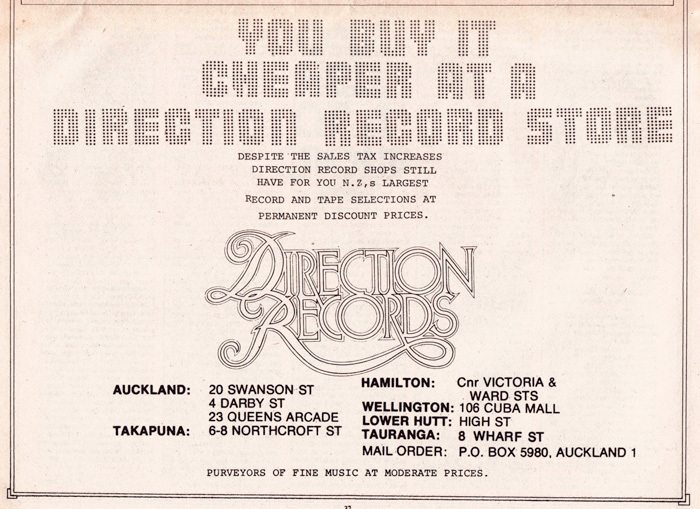 They had records for sale in both their large Queen Street store and at branches in Remuera Road, Birkenhead, Lynmall and Queens Road, Panmure, until they closed Queen Street in May 1975, moving to the new Downtown centre, where they still sold records. At the end of the year, the city business was purchased by Christchurch chain Haywrights which was in turn purchased by Farmers in 1982. The Downtown store ceased stocking music around this time. The suburban Milnes stores slowly shut down too, with Remuera being the last, although it was long under different ownership. There was a McKenzies (which was rather like an NZ owned K-Mart chain), in Queen Street, which ran between what is now Bond & Bond and Vulcan Lane; it sold vinyl near the Vulcan Lane door. I liked the grand portrait of the founder, Sir John McKenzie, on the staircase. LD Nathan purchased the chain in 1980 and merged it with the similar Woolworths stores, closing the Vulcan Lane/ Queen Store shortly afterwards. The Woolworths store near Queens Arcade continued for a decade and a half, rebranded as DEKA, and it too sold music but very Top 40 and budget. The success of McKenzies' record retail in the 1960s and 1970s led to record labels releasing a range of low priced albums targeted at the store. There were also inner-city McKenzies in Symonds Street and K Rd (between Rendells and George Court). For many years there was a row of bric-a-brac stores on the eastern side of Queen Street, about where Mayoral Drive cuts through now, full of ever-changing boxes full of dusty vinyl, with loads of 7” singles and sixties soul and pop, including one called Town Hall Bargains where Chris Hart, later of Real Groovy, was first seen behind a counter. It was always a goldmine. The site of the third Real Groovy store, 492 Queen Street. Real Groovy was initially at the in Richmond Rd in Ponsonby (called Notoriety) near where Harvest Wholefoods is now, then the top of Mt Eden Rd and then on the corner of Queen Street and City Road before it moved in 1991 to where it is now. 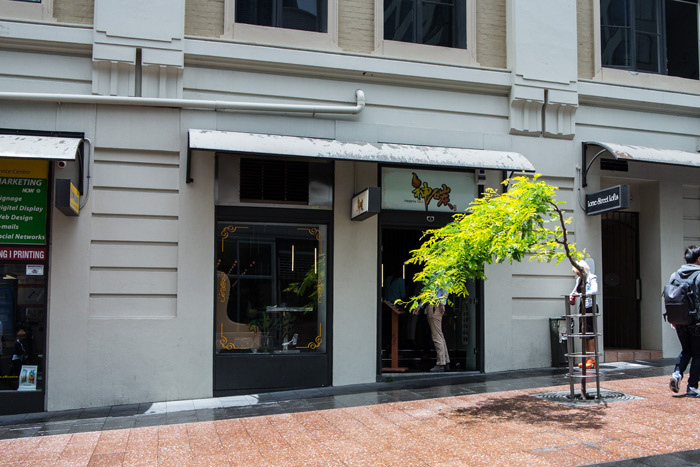 Conch was in the Canterbury Arcade for several years before it moved to Ponsonby. Marbecks had a second store at 164 Queen Street from 1996 to 1998 until the notorious power failure that year saw a retreat back to Queens Arcade where they still trade. 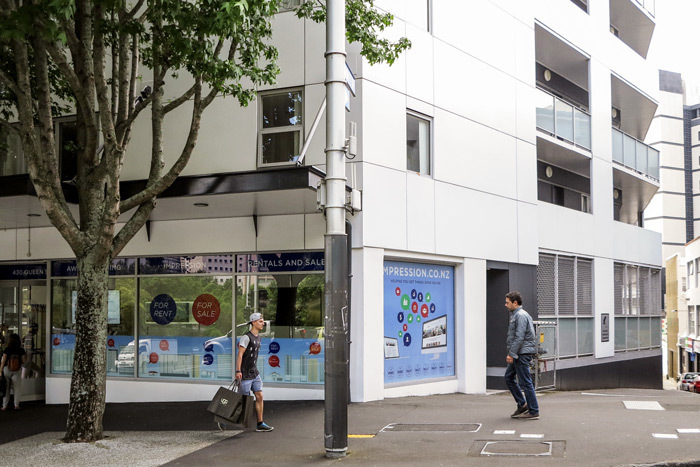 In January 2015 Southbound Records moved from 69 Mount Eden Road to 132 Symonds Street. This story first appeared in the blog The Opinionated Diner in April 2010 and was revised and fully updated in 2015. Thank you to Adam Miller at the superb 78rpm.net.nz for several of the shop stickers shown above, and to Grace Cardwell Scouller for the mine of information and images. Thank you to Desmond Paul for the information on Gordon Dryland. The lost record stores of Christchurch.